Last Saturday, as we have done for the previous couple of years on the third Saturday in February, we dined at l'Image, to partake of Jean-Michel's special Saffon Menu. As usual, we had booked for earlier than the locals, so as no one else was in the restaurant, we had a drink at the bar and a chat with Christophe. We were introduced to the man who came in soon after us and we all stood around discussing politics, as is proper in France. Jean-Michel emerged from the kitchen, as we weren't giving him anything to do, and joined in the chat (much discussion about the various activities of the new local Council, around the swimming pool improvements and new housing blocks available on the river there, as well as the upgrading of the street that leads to Jean-Michel's one day to be finished house). Christophe teased Eric about his facial hair, which apparently has been re-sculpted every time they meet. Simon teased Jean-Michel about appearing in the Nouvelle Republique (talking about how the restaurant was going in the current economic climate and what his expections were for the coming year – he says in the season, half the customers in the restaurant are English, but they won't know until May if the English will be back this year). Eric teased Jean-Michel too and addressed him as Monsieur Safran. Jean-Michel asked Eric if he had seen our blog and when Eric said he hadn't, J-M fetched a printout of my post about cooking his carp recipe! He had auto-translated it into French so he could read it and told us he was particularly interested to learn about the traditions surrounding the fish in the Czech Republic and Slovakia. Eventually we moved into the restaurant, after a party of 11 had settled themselves in to lively and very noisy multi-generational French family discussion. In the end, this group, us and another group of 9 who arrived not long before we left, were the only tables occupied, but Christophe told us that they had done 80 covers at lunchtime, and were turning people away, so they were happy. Also, after service finished they were all on two weeks holiday. While we are in the restaurant we have a chance to chat a little with Martine if she is not too busy. Luckily, between main and dessert she had time to talk and told us how pleased they were with their new staircase in the house she and Jean-Michel have just built. 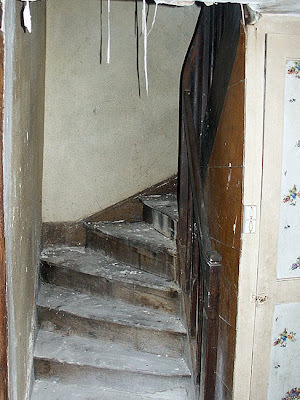 Because the space the staircase was to go into was unusually wide and not standard, several local artisans said they could not even quote to do the job, because they could not just crunch the numbers through their computer programme. Finally, she and J-M found a menuisier from Tournon who quoted in the old-fashioned way and has done an excellent job of the finished staircase. Martine told us how much they had paid and it compared favourably with the one quote we have for our staircase so far. Needless to say, we will be hot-footing it over to Tournon in the near future to visit M. Brunet. As if I didn't already have enough to think about, the matter of door furniture raised its ugly head the other day as we were walking down the street. 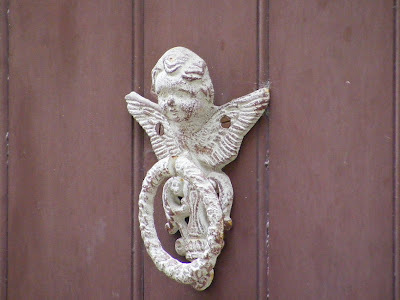 We saw this cute little beast on a doorway near Jill and John's house, and were quite taken by it. There is an alternate model to be considered, however. 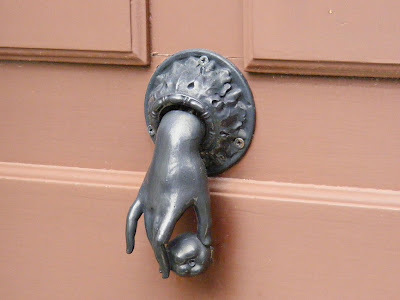 It's a bit weird, but for some reason I like the "dead lady's hand holding an apple" knocker. After much deliberation and taking of advice, it was time to start on the new floor for the bathroom. With our minute hire car (a Seat Ibiza) we went to Bricomarche to buy a 4 metre length of wood. Having chosen what we were after, I was handed a saw to cut it to length so, hopefully, it would fit in the car. I don't do sawing, especially not in public. I have never got the hang of "dad sawing" - you know: a few fast strokes, and then a few slow strokes, finishing off with a few fast ones and your huge log is neatly sawn (nicely explained 4 minutes into this Eddie Izzard video - with swearing). I do mangling. This time, however, I was pleasingly competent, and managed not to embarrass myself. We also bought some expanding bolt things (highly technical here...) and managed to fit it all in the car. Just. Getting the stuff home and up the ladder - along with all the tools I would need - was interesting, but not difficult. 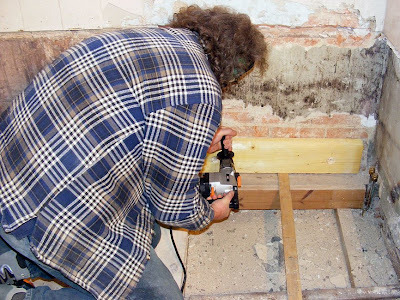 First move was to chip all the render off the walls so I was bolting the wood directly to the brick. For this the render chipping off pick that Susan's father bought for me last year was used - and it works really well! I measured and checked levels, measured some more , made a decision, then cut my wood. Happily, I proved fairly competent using my own saw in my own house, which was nice. I think the first decision I made was not completely correct, but it shouldn't be a real problem. I decided not to take the wood right up to the side walls because the brickwork had been all chased away for pipework, etc. I think the solution (next time I am working on it) will be to drill completely through the wall and use stainless steel threaded rods and a bracing plate. Or maybe just big bolts (18mm bolts, 20 cm long) through a metal plate on the outside wall and into the wood. Anyway - I have started, and done what I think is probably the most technically challenging part: reaching across what amounts to a void to bolt a lump of wood onto a wall, and getting it level. 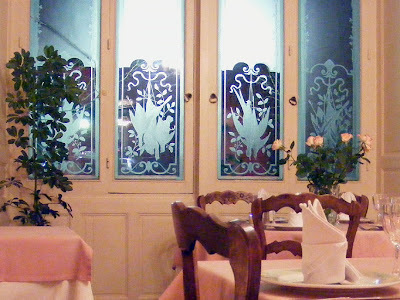 There is an Hotel de l'Esperance in many towns. Ours is run by the formidable Jeanine and has a loyal following of regulars. When we were having our roof replaced Stanik and Janik ate there every day. Because we were only in Preuilly for a few days, and were focusing of renovation work (for once!) we decided it was probably easier to lunch with the other workers and went to l'Esperance. Turns out our neighbour Sylvie was making her debut there as a waitress. Pierre-Yves, her husband was in there too, lunching with a couple of other men. This gave us the opportunity to let them know we didn't have any water in the house (again) and admit that we had gone over to their place the night before and helped ourselves from their laundry while they were out. As the only 'Anglos' in the place, we provided the theme for the lunchtime conversation throughout. I overheard various discussions of who does and does not speak English, and which of the expats in the community, both British and American, speak extremely good French. When sometimes I didn't hear what Sylvie had said, or didn't quite understand, someone (a complete stranger) from one of the other tables took it upon himself to chip in with a translation. 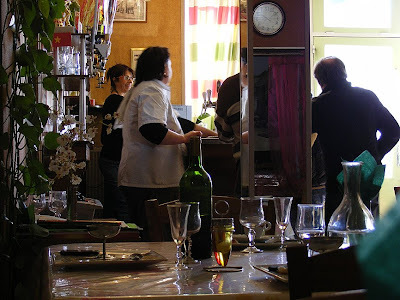 Of course these diners find non-fluent French speakers a reliable source of entertainment, but it is also perfectly normal in these situations for inter-table conversations to be held, and certainly all present greet everyone else in the room on arrival. 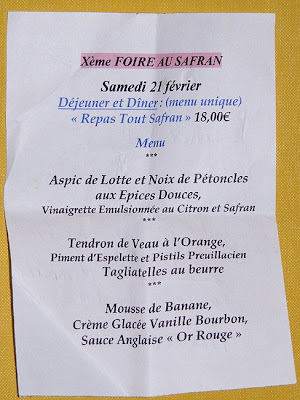 The food was the usual no choice menu (except between viande or poisson for the main course). It was all tasty and very French. A bottle of red wine was already sitting on the table, opened, to indicate that it is a refilled bottle of house wine. Sylvie delivered a carafe of tap water and a basket of baguette slices. First course was a sort of bean and vegetable pate served with tuna stuffed hard-boiled eggs all garnished with the sieved yokes of the eggs. Sylvie described it as lègere, although I'm not sure I consider anything with an egg and a half and a generous serving of vegetable pate as 'light'. 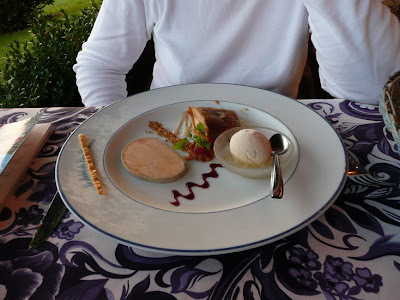 We remembered to lay our cutlery back down on the table once we had finished, as it is normal in these sorts of restaurants for diners to eat their entrée and main with the same knife and fork. We chose fish for the main, and it came as a piece of white fish, rolled and poached and served with rice and a white wine and tomato sauce. Sylvie warned us 'Attention ! Les arêtes !' ('Watch out! Fishbones!'). 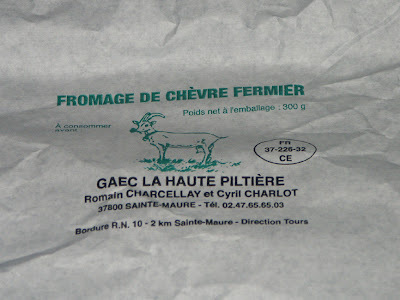 Then there was a selection of three cheeses – a camembert, individually wrapped Kiri and Ste Maure de Touraine. This is served on a plate that is moved from table to table as people are ready for the cheese course. Dessert was semoule (semolina),which Sylvie recommended as very good, and indeed it was. The serving was small, as one just needs a couple of mouthfuls of sweetness to finish off the meal. All this is included in the prix fixe of 11€. We had coffee too, which is another couple of euros. At the end of the meal we caused more entertainment, as I tried to pay by bank card, which Jeanine does not take. I only had 10€ on me, so I said would have to go to the bank and return to pay. Jeanine did not seem in the least put out by this, just amused. If you're looking for an every day French experience, l'Esperance is the sort of restaurant / bar you need to visit. If you feel like practicing your French, there is always someone willing to chat - you may get teased, but if you reciprocate it is appreciated; and if you're wanting a quiet (often brightly coloured) drink, there is always a quiet corner. Bonjour Pascal ! Aujourd'hui vous êtes la vedette du blog ! You wouldn't see that in a National Trust property. We've just had our annual winter crise d'eau. Last winter our non-functioning boiler sprang a leak and flooded the house and street unbeknownst to us until we returned to find the water had been turned off in the street by the garde champêtre. This year,with the unusually cold weather, our aged and apparently fragile plumbing pipes burst in quite a few places. 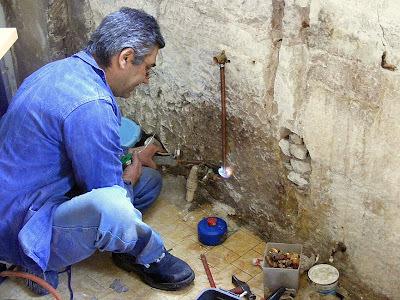 Reporting our urgence to the local plumbing firm, Bertucelli, produced Pascal last year, and again this year, to set us to rights. 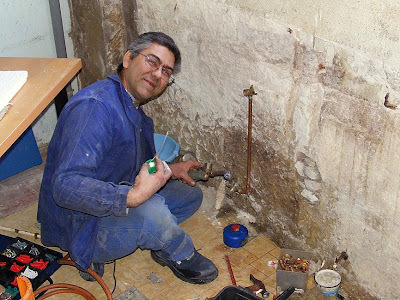 This time he has disconnected all the old pipes and installed a single tap where the water enters the house (eau de ville). Pascal is a nice man and a very competant plumber. Fixing our plumbing is always a bit of a challenge for him, as it is old enough not be in any current standard size. He spends quite a bit of time rummaging in his van through a considerable collection of bits that might come in handy sometime. Connecting the new tap involved brazing all the pipe joins. This is something that involves him getting out his little orange gas bottle and lighting his blowtorch. 'Hot work', as this is known, is completely banned in National Trust properties, because of the risk of setting fire to buildings. It was banned after the devastating fire at Uppark in 1989 was started accidentally by lead soldering on the roof. The massive conservation and restoration project this triggered was taken so seriously that the then Head of Conservation was issued with the very first 'transportable telephone' in the National Trust. Pascal, who doesn't have to worry about such foolishness, casually set up his work on a plastic crate, resting on a large shifting spanner. He was delighted when we asked if we could photograph him, going to the extent of calling us in slightly later when he thought there was another photo opportunity. He also corrected my French when I told him when he would be appearing on the blog, making me 'repeat after him'. Pascal is one of those generous people who can do this sort of thing without making me feel patronised or a complete linguistic failure. So for the time being, we only have one tap and the toilet has to be flushed using a bucket. 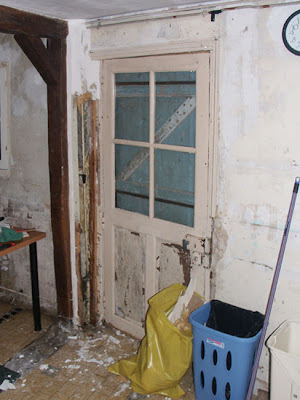 This is "the one step back" - the two steps forward is still to come: we have just seen Pascal's colleague, Monsieur G. to discuss our full plumbing and heating requirements and he has gone off to produce a devis (estimate) for the work. We arrived in Preuilly at 4.30 after flying in to Tours and picking up a Seat Ibiza at the airport. Our first stop was Leroy Merlin in Chambray le Tours. This was to check out our selection of items for the bathroom to see if they live up to the pictures. Amazingly, they weren't disappointing. 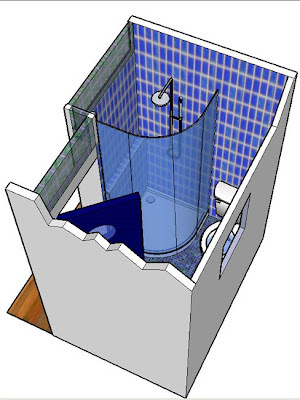 I think the shower screen and shower unit will make a good pair, and even on the small 80cm quarter round base we should have room to swing a cat (albeit a small one). They also had an interesting selection of kitchen sinks, which is just another of the 30 billion or so decisions we have to make in the next couple of months. From there, we drove to Preuilly, stopping in Veigné to buy a baguette for lunch. 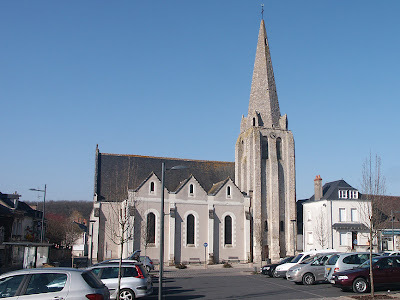 The church in Veigné is really attractive, with a stone spire - think of a pointed stone wall and you'll get the idea. It must be said that although as we left London we agreed the weather was dismal, in the Southern Loire it was a beautiful early spring afternoon - not bad for late winter. 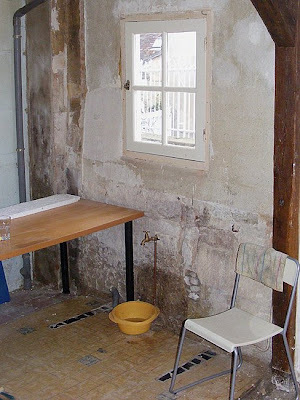 We called in to the plumber's to see if they had received our email, which they had - and they had replied - but as usual with email from orange.fr email accounts, we didn't get it. Just as well we called in, because they had written us in for a visit at 11.00am on Friday. We then drove to the house. Great news, everthing appears to have survived the big freeze. No puddle of wine on the floor from where bottles froze and exploded, and nothing had fallen over while we were away. Then I turned on the water. Although we had turned off the water and run all the water left in the pipes through the tap when we left after Christmas, I hadn't drained the system down at the stopcock. To be perfectly honest, until a couple of weeks ago I hadn't even heard about draining the water down. I now know why it's a good idea. When I turned on the water a spray shot across the kitchen - the copper pipe had split where it crosses the kitchen wall. So we got in the car and went back to the plumbers (via the menuiserie, who we learned we were expecting at 6.00pm on Friday). Unfortunately the plumber was busy - probably fixing the pipes of other English people who had just arrived back in town. As it was an urgence they said they would be here as soon as they could to fix the leak. We then went off to Yzeures supermarche to provision ourselves. On the way we stopped in at Gamme Vert and picked up a roll of plumber's fixing stuff tape to do an emergency fix. When we got home, I taped up the split and turned the water on. We could hear water running, but none was coming through the tap. I turned the water off again and realised the water was trickling out of the base of the wall. Until that moment, I had assumed the wall by the door was stone, but it was only plasterboard (actually until that moment, I hadn't really looked at it.) I grabbed a hammer, did some "finessing" of the plasterboard and found a pipe running up the wall. With a split in it. I taped up that split, turned on the water. We could hear water running, but none was coming out the tap. There did appear, however, to be water running under the sink. We opened the cupboard under the sink (something we have resisted doing before) and saw that the pipe was split there. I taped up that split, turned the water on. We could hear water running, but none was coming out of the tap. There was a lot of noise, however, coming from the toilet. I opened the toilet door and saw the pipe was split leading to the tap for the washing machine. I taped up that split, turned the water on. We could hear water running, but none was coming out the tap. So I turned the water off again and we agreed that until the plumber arrived on Friday we would survive on wine. Methinks that plumbing may be one of our first jobs. 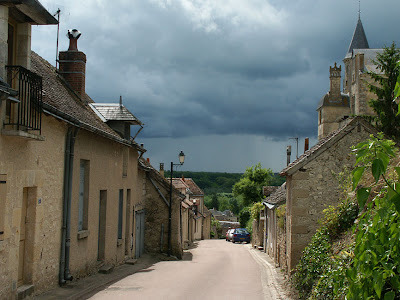 OK, so it's not the most dramatic looking place we've ever featured on the blog, but the name Carroir au Loup (just north of Preuilly on the road to le Petit Pressigny) is interesting. Carroir is an old local word for crossroads, and loup is French for 'wolf'. What happened here for it to be called 'The Crossroad of the Wolf'? There are dozens of places in France that reference wolves. 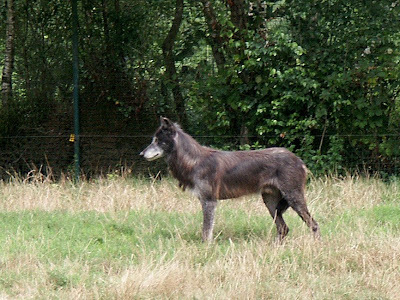 Here in the Touraine, Poitou and Berry we have Pette Loup ('Beware Wolf'); several Chanteloup eg near Amboise; Bois de Chanteloup, between Mézières-en-Brenne and Chatillon-sur-Indre; Saint-Loup-sur-Cher; la Robe de Loup ('the Wolf Coat / Skin') near Ingrandes in Vienne; l'Alleu des Bois and l'Alleu des Champs, south of Oyré ('leu' is the old spelling for 'loup'); la Pont de la Leu at Chalonnes-sur-Loire. Pouring over any reasonably detailed map will reveal many more 'wolf places'. In the middle ages there were specialist wolf hunters, who set up camps in the woods (chanteloup) and constructed shelters made of branches known as culs-de-loup ('wolf arses'). Chanteloup is presumably one of those neat French word plays, conveniently meaning both 'wolf works site' and 'singing wolf'. The wolf hunters were fur traders and often themselves wore clothes made of wolf pelts. In the summer of 1695 there was an rash of wolf attacks in the Touraine, with a number of people being recorded as having been 'eaten by wolves', and the priest at Fondettes wrote that wolves had killed or wounded many children in his own and neighbouring parishes. By 1900 there were only 500 wolves left in the whole of France. The last wolf in Indre et Loire was shot at Ferrière Larçon in 1908, and the last of the original wild population of wolves in France was killed in 1939. 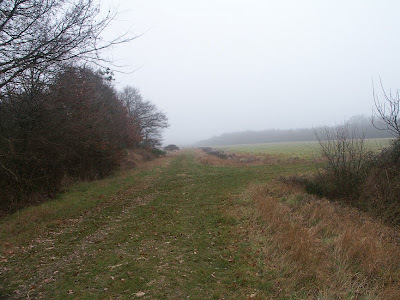 I have written more on wolves over on Loire Valley Nature. Rabbit is a very popular meat in France, and rabbits for meat are raised both commercially and in ordinary backyards. Wild rabbit is also available during the winter hunting season if you know someone with a hunting licence. 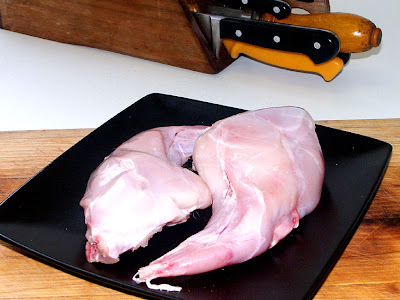 Rabbit meat is not cheap. I was lucky enough to pick up two cuisses (thighs) reduced to half price recently in the supermarket. The label told me that the rabbit was born and raised in France, and the thighs weighed 464g in total, originally priced at €7.48, reduced to €3.80. The label further informed me that the rabbit was guaranteed to have only been fed vegetable and mineral material. The brand name it was being sold under was Le Volailler (The Poultry Merchant). Rabbit is typically sold on poultry stalls in the markets, but you can often get it from the butcher or game merchant as well. Pre-heat the oven to 120°C. Heat the oil in a heavy based frying pan. Gently fry the saucisson until it is lightly browned and the fat runs. Transfer the saucisson to a casserole. Next, brown the rabbit and transfer it to the casserole. Then sweat the onion in the frying pan, but do not let it colour. Transfer the onion to the casserole when it is soft and translucent. Put the carrot, celery, bay leaf and thyme in the casserole. Make sure everything is fairly tightly packed in the casserole, then add the apple jelly, salt and a few grinds of pepper. Cover the casserole and put in the oven for 1.5 hours. Turn the rabbit over at half time. Remove from the oven and take out the rabbit pieces, vegetable chunks and saucisson. Put them aside to keep warm. Strain the broth and boil it hard to reduce to about half a cup of liquid. Whisk in the crème fraîche and cumin. Serve the rabbit accompanied by the chunks of meat and vegetable from the casserole, and some mashed or steamed potato. Generously spoon the sauce over the rabbit. I would rate this dish in my current top 20 favourite main courses. The sauce is piquante, savoury and delicious, the rabbit tender and moist, the vegetables retain their vibrant colours. Simon, who is not a fan of white meat, (nor of rabbit in particular, for more socio-cultural reasons) was less impressed. We have arranged for the menuisier (that is joiner, rather than a carpenter, who does roofs) to visit and give us a devis (estimate) for a staircase. At least, we think we have arranged for him to visit and give us a devis - we shot an email off into the void and haven't heard back yet. This is not uncommon, although whether it is that the menuisier hasn't replied, or if he has replied and our email program has eaten the reply (it does this with emails from France quite often) we don't know. With any luck, we called in on him yesterday on our way into town just to firm the arrangement up*. 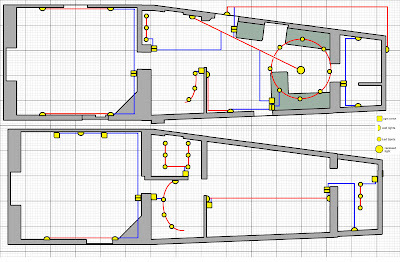 We have rejigged our plan for the staircase: originally we planned to have it replaced like for like all the way up (but in exotic wood), but now we may settle for like for like on the first flight, and be less ornate on the second flight. 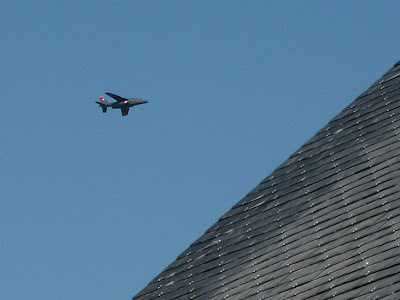 We are also hoping that some of the wood from the second flight can be re-used on the lower level. We have arranged to be visited by the plombier (same situation regarding email and calling in as with the menuisier). This is to talk about heating and plumbing stuff in general, as well as getting a devis for plumbing up a shower room (or maybe the bathroom, or maybe both) and a couple of toilets. We are also hoping to run into one of our neighbours who is a decorator and plasterer to see how much it is likely to cost if we decide to pull down the ceiling in the kitchen and have it replaced (it's a bit yukky and has electrical stuff all through it that I want removed before we start installing again). We also need to have the ceiling in the front room replastered (this was done properly in the past with laths and real plaster, then unfortunately covered up with polystyrene tiles). And also, we have to buy some wood so I can start on the frame for the bathroom floor. Not the busiest of days (on paper), but I will be surprised if we get it all done. This is me and my brother-in-law John cooling our feet in the lavoir at la Guerche, which like all lavoirs (communal laundries) is on the banks of the river (in this case, the Creuse). It was so hot and the river so low that a group of canoeists out on the river ran aground on the old ford which crosses the river just here. They had to hop out and walk the canoes up river for some metres. John and I, standing in our ice cold pool and squidging the frog poo and accumulated algae between our toes, exchanged friendly waves and greetings with the canoeists. Most of you will know that this is 'goodbye' in French (more literally, it means something like 'until we see each other again', voir being the verb 'to see'). Many people contract au revoir when speaking to something that sounds more like 'oh-vwar', but it is not unusual in the Touraine to hear someone give it the full Edith Piaf treatment – 'oh rrrrrrrevwwaarrrrrrrah'. Curiously, this method of delivery is particularly common amongst female motorway toll booth cashiers. That's right, you do not just hand over your toll (which can be anything from 90c to €26.50, depending on where you are). You greet one another with bonjour, you say violà when you hand over the money, the cashier says merci, then when you are handed your receipt you salute one another again with a chorus of merci, bonne journée, au revoir. The same routine is performed with supermarket cashiers and indeed any shopping transaction. It is important to bid your fellow shoppers bonjour and au revoir in a general salute as you enter and leave the shop too, whether you know them or not. à toute à l'heure – this is used if you have arranged to see the other person at some specific time, usually later the same day, or at most at some time in the next few days. I learnt this one at school, but then forgot about it until one day I made a booking at Auberge St Nicolas for dinner later the same day and the nice woman who runs the place sent me on my way with à toute à l'heure. à bientôt – 'see you soon' – for the casual friendly social situation or encounter in the street or market with neighbours. à la prochaine – 'until the next time' – useful for when leaving the bar. à demain – 'until tomorrow', 'see you tomorrow'. adieu – I have never actually heard anyone use this. I am guessing it is considered very old-fashioned, especially as it means 'with God' – probably Napoleon outlawed it or something. 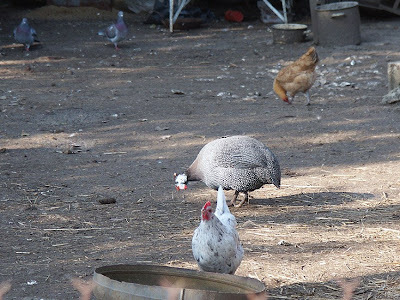 Guinea fowl is very popular in France. All the supermarkets stock it, and many people raise a few in their backyard chicken run along with the other poultry. We like eating them - especially at Christmas. To be able to make the claim that this is a farm raised guinea fowl from Loué, the bird must have come from a small farm located in a certain geographical area and been raised using traditional husbandry methods. You can read the full specifications for certification on the EurLex website (section 4 at the bottom of the page is the most interesting /relevant - and it's in English). As you can see, we waited until farm raised Loué guinea fowl was on special, and particularly good value for money. 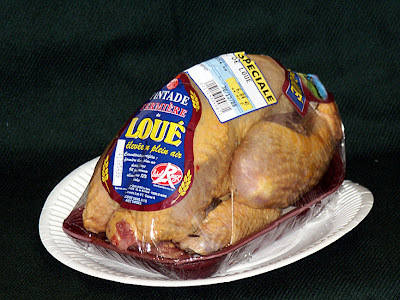 Traditionally raised Loué poultry is famous throughout France, and the area it comes from is centred on the town of Loué, just west of Le Mans, and about 2½ hours north-westish of Preuilly-sur-Claise. The classification extends down to border cantons in Indre et Loire – so volaille de Loué is local produce for us. Preuilly sur Claise is a quiet town most of the time. Our usual soundtrack is the clucking of chickens, the calling of small wild birds, and the clatter of a self propelled sewing machine making its way through Place des Halles. On Sundays we hear the hound packs getting excited, and if the wind is blowing in the right direction we can hear the bells of l'Abbaye. Occasionally though, this bucolic idyll is broken by the sound of training jets from Tours. It doesn't last for long, but it does provide a moment of excitement. If I am quick, it also provides an opportunity for me to be artistic. 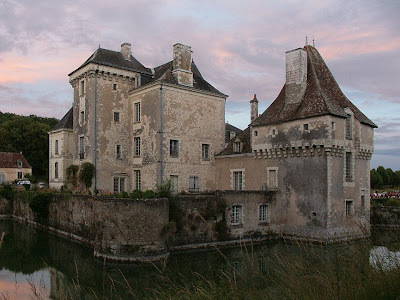 We have driven past the chateau at Boussay many times, and have often stood at the gates and taken photos of the facade. The gardens are open to the public, but being very mild mannered and not completely sure of the etiquette we have never ventured in. Last year we attended a hunting horn (Trompe - or Trompette - de Chasse) concert in the grounds of the chateau, which gave us an opportunity to wander around the gardens and get some different views of the chateau itself. These were taken in near darkness, late on a beautiful July evening. 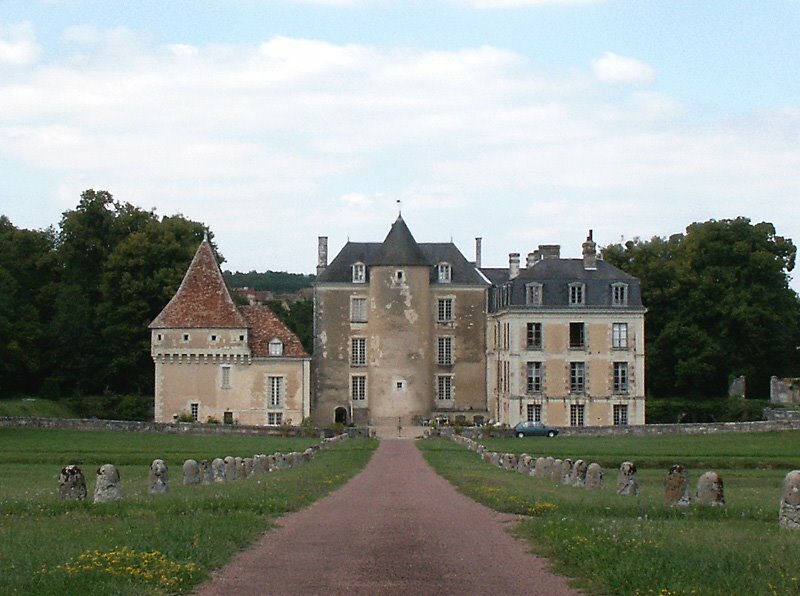 The Chateau has an interesting history, having been founded by the Barons de Preuilly (who built the Chateau du Lion overlooking Preuilly) in the 11th Century. The Chateau is still owned and lived in by descendants of the founding family (a concept that staggers me). Because it has always been lived in it has never been restored, but rather remodelled and updated regularly, with constant maintenance in between. 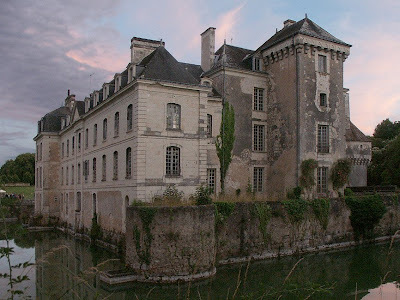 The owners have written an interesting web page about the chateau, so instead of repeating and recycling, I will point you to in its direction - here (in French) or here (translated by Google into English) depending on your needs. 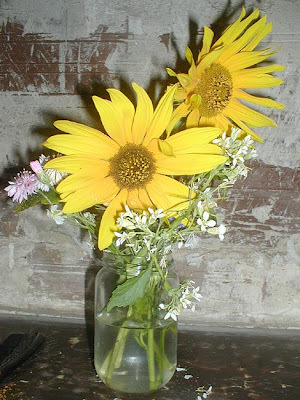 When I arrived back in Preuilly in late September 2008 after a conference, Simon had picked a few of the little sunflowers (les tournesols) from our garden and displayed them on the mantlepiece with some cornflowers (les bleuet) and sweet rocket (la julienne des dames), also from our garden. I am not sure who was having the van Gogh moment – him for arranging them thus, or me for photographing them. French chicken bottoms are apparently really clever things. In common with many other countries, French eggs come stamped with all kinds of data. The egg box tells you that it contains 6 eggs from chooks raised in the open air. It also tells you the name and address of the producer and gives a best before date. These eggs come from our local egg farm. We bought them in the supermarket, but we could just as easily have called in to the farm and bought them direct. The eggs themselves are stamped with a '1' which tells you that they are certified as free range, 'FR' which tells you they were produced in France, then a code which I can't read properly, but I believe identifies the producer. Just for good measure, they are stamped with the words 'PLEIN AIR' ('open air', meaning the hens are 'free range', not 'battery'). 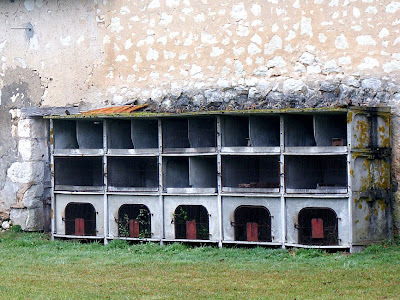 European law means that the hens on this farm must each have a minimum of 4m² of grass (not just bare earth) outdoors and indoors be no more than 9 hens per square metre of useable space (with 4 stage levels allowed). There is no limit on the size of chook sheds or the total number of birds on the farm. There are no particular regulations regarding the constituents of the feed, the number of egg collections per day, or the age of the egg when packed. The next certification above this is Label Rouge (élevées en plein air). Label Rouge is a uniquely French food quality assurance system, originally started by poultry farmers alarmed by the effect on quality that modern 'industrial' farming methods were having in the 1960s, and now administered by the Department of Agriculture, which aims to codify traditional best practice and geographical provenance, with the purpose of ensuring high quality produce and high levels of animal welfare. Hens enjoying the Label Rouge lifestyle would have a minimum of 5m² each of grass and the whilst the indoor stocking rate is still 9 hens per square metre, it is calculated using the ground area only and farms are limited to two chicken houses containing no more than 6000 birds per building. With Label Rouge certification, the feed is strictly regulated, as is the egg collection and the maximum age of the egg when packed. Label Rouge farms are inspected, and the eggs tested for food safety and tastiness, and naturally, this comes at a price. Many farms comply with the Label Rouge rules, but feel the price of certification is too high for the premium they can put on their product, so they rely on the fact that they sell locally and are personally known by their customers, who trust them and their product, and benefit by not having the price of certification passed on to them. 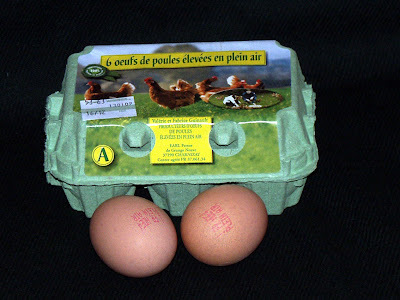 The certification level below 'oeufs de poules élevées en plein air' is 'oeufs de poules élevées au sol', which translates as 'eggs from hens raised on the ground'. It means the hens are uncaged, but spend all their lives indoors in a big, often multi-level barn. In other respects the regulations are the same as for 'free range' hens. * Neuf oeufs neufs à neuf heures (I hope I've got that right!) – see Living the Life in Saint-Aignan for a discussion of the grammar and phonetics of this phrase, and a discussion of buying eggs in France. Doing Electricity. Part 1 of many, no doubt. 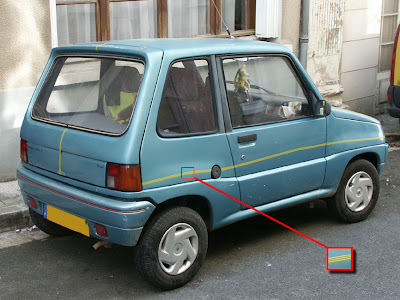 I think I may have mentioned I am planning our electrics. (Yup, I have, here). This has turned into a monster job, because I may have got carried away. Not for me one light bulb hanging in the middle of the ceiling and three power points in each room - this is going to be done right and proper. After a week and a bit of thinking I have graduated from my piece of paper to using the computer, plotting everything on Photoshop. The results are scary, even when written out in my own invented code. I am going to have so many cables running around the house, it will be like living in a Faraday Cage: I have, at last, worked out what I want to go where. So that was stage one. Stage two will be a challenge. I have two alternatives to this: one is bringing the supply into the house by taking the three phases through the wall and installing a new board, and the other is getting EDF to put in a new supply for us straight into the kitchen. This appeals on one level, but it does mean the house will be a new wiring job rather than a rewire, and in France that means having no less than the legal minimum of power points, lights and phone points in each room. Not that that SHOULD be a worry, but what if I don't want a telephone point in every bedroom? Of course, being France, you can buy all the bits you need in any old hardware store - even down to pre-loaded conduit, so once you know your plan it should all sort of fit together. You can also buy many books which explain it all, because a true Frenchman likes to do these things himself. I mentioned previously about using LED spotlights in the kitchen, bathroom and over the stairs. I love the idea of never having to replace a lightbulb, but wiser heads have counselled me, and I am reconsidering. As for fittings, I really want to use Legrand switches and power points because they are so funky. You can get an idea of the sort of thing they do from the website here and here, but be warned, it's all a bit irritatingly French. So there you go. I now have a plan. This will be discussed with the electrician and no doubt changed. I hope it doesn't have to be changed too much. I had a bit of a beetroot fest on the weekend, after buying a tray of uncooked beetroot. I did roast beetroot to go with the roast chicken on Saturday, then added the leftover chicken to a thick stewy borscht and I made a rather complicated chocolate cake containing beetroot for added depth of colour and flavour. The borscht was good (which is just as well, as there is lots of it) but the cake was disappointing (although not because of the addition of beetroot). 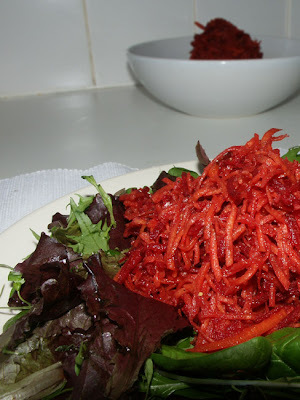 The first thing I made though is a classic French winter salad – grated carrot and beetroot. I used Clotilde's recipe from Chocolate & Zucchini, although, as is my usual habit, I replaced the mustard her recipe calls for with cumin, as cumin goes so fantastically well with carrots and beetroot (and mustard, frankly, does not). 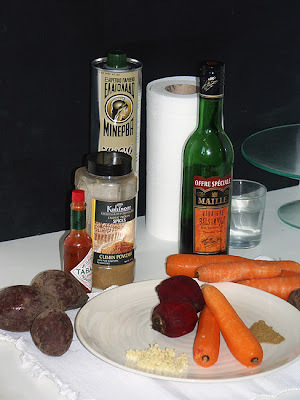 This is one of the few recipes where I use a food processor to grate the vegetables. Chop the vegetables into large but evenly sized lengths, and put 2-3 pieces in the funnel at once. Keep the pressure on with the tamper, and with these hard dense types of vegetables, the fine grating blade produces just the right size and shape of shreds. To grate by hand results in too much liquid being released (some of it knuckle blood) and the shreds being flat and easy to crumble. PS Eating beetroot does produce a side effect which can be rather alarming if you have not encountered it before. Put it this way – no, you do not have bowel cancer or some frightful disease of the urinary tract. Rather, the marvellously good for you anti-oxidant chemical (anthocyanin) which causes the beetroot to be such an amazingly deep rich red colour is very robust, and survives to colour all in its path on its journey through the human digestive system. We have received emails giving us further information about two of the topics we posted about recently, so if you want to read what my father said about Bushfires, or what someone who knows la Forge had to tell us, click on the links and read my updates. When we are living in France, Susan and I will have to earn an income. At the moment we are not sure how, but I know exactly what business model we will be using: "the exact opposite to Ryanair's". Whatever it is we do, we will show a price. A price that you can look at and say "that is what it will cost me". We will not be showing a stupid low price we have made up, adding on all sorts of fees and "government charges" (most of which are made up), adding a charge for using a credit card (which are the credit card fees they are charged, multiplied by 6 and applied to each person, not each transaction). Nor will we be making up our own exchange rate, telling your credit card company that you purchased in your home currency, and ripping you off another 8% (over and above the tourist rates from the Post Office) in the process. That way, we hope not to make our customers boiling mad before they have even started. I know I should know better. I know I should expect to feel ripped off by Ryanair when I fly with them, because that is what always happens. If they were to be honest, say "this is what the ticket will cost" and charge me that amount, I would be happy. I KNOW airline tickets don't cost 1 penny, I don't expect them to cost 1 penny, and I wouldn't fly with any airline where the tickets DID cost 1 penny. Why can't they be like Air France and charge 86€ (£79.93 at today's tourist rate) for a 86€ ticket Paris to London, rather than charge me £77 for a ticket from Poitiers to not very near London that "costs" 48€, (or 78€ including tax, fees and charges). Is there a better way to induce air-rage that treat your customers like this even before you have managed to upset them by the complete lack of customer care once they are with you? At least soon we won't have to bother with them. Skype has released version 4. We used Skype quite a lot, both of us having family in Australia, and of course we have to call France increasingly often. Skype does save us a lot of money. I wouldn't, however, recommend downloading the latest version. It takes a lot longer to load up, and as is the way with these things they have introduced a couple of "improvements" that appear to have no purpose. The most annoying change is the fact that now to place a call you seemingly have to start a "conversation" first. Also, phone numbers are no longer shown with people's names, so as a reference resource it is pretty useless. If you have downloaded the new version and don't like it, you can download an old version here. We have been watching news of the bushfires in Victoria, Australia with increasing horror. As this is written the death toll stands at 131 people, and is expected to rise. We both have experience of bushfires: Susan can remember the fires of the 1960s in central Victoria, in particular the Lara fires (which having looked them up, were 1969). She remembers her father blocking the downpipes with tennis balls and filling up the gutters with water, and strategically placing milk pails full of water around the house. She remembers her mother packing a laundry basket full of blankets, ready to evacuate while her father was out with the volunteer bush fire brigade fighting the fire. She remembers seeing the flames along the top of the ridge on the neighbours property. She remembers seeing her uncle arrive at the garden gate, completely exhausted, covered in ash and soot and with bloodshot eyes he could barely open, after losing the battle to save his home (the house that she lived in as a baby). The family lost two houses in those fires, and two uncles were hospitalised, one with burns, the other with smoke inhalation, a result of being out fighting the fires. Farm animals were lost, both in the fires, and after, because of eating too much rich new grass. Machinery and equipment was lost too. But no one [in the family] died, houses were rebuilt and new cars and farm machinery bought, stock was replaced. There is a famous family story about Susan. She had a koala stuffed toy (made of kangaroo skin, the sort of thing most Australian kids at the time had). It went everywhere with her when she was a toddler. Apparently, she threw this koala out the car window in the midst of evacuating during a bushfire on a family outing. Once having arrived at at the place of safety the destination, she proceeded to make such a scene about not having her koala that her father drove back, presumably in the direction of the fire, to find the koala on the side of the road! Susan, the koala, and her father all survived this adventure, and the koala, bald and moth-eaten at the end, lasted into the '70s. My memories of bushfires are quite different. Until the late 1970s I lived either in nice, safe London, or nice, safe Canberra. In early 1979 there were large bushfires on the north side of Canberra and I was a volunteer bushfire fighter. Purely by chance I ended up fighting fires with a crew from the CSIRO (Commonwealth Scientific and Industrial Research Organisation) Bushfire Research group. We spent as much time filming bushfires racing up hills towards us at 40 miles an hour as fighting fires and damping down burnt out houses and farm buildings - equal parts exciting and scary. I didn't get home until 7.00am - and then went straight to school. 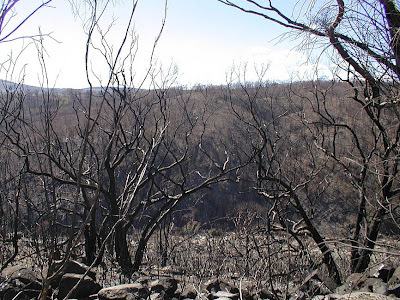 Since then, Canberra has had more fires, including one in 2003 which destroyed over 500 homes, and the Mt. Stromlo Observatory. Like Susan in 1969, various members of my family have stories of sitting around with cars packed, waiting for the order to evacuate. (Remember, this is not the outback - this is Australia's capital city). Like Susan, the items packed may not have made much sense to anyone else: for my father it was a car full of photo albums, and for my daughter (who was allowed one bag and one object) her favorite shoes and her saxophone. In the 10 years we have been in London my (now sold) house in Queensland narrowly avoided being burnt out by bushfires, not once, but twice. I think everyone who has been exposed to serious wildfires is scared by the prospect of another one. I know I am. Many tough Australians can be reduced to silence - if not tears - by pictures of out of control fires. The death toll from all the fires is now 183, and expected to go over 200. Most people have died in their cars, caught out on the roads by how fast the fire moves, but my father says that even when people have had good equipment and proper fire plans, it has been luck whether they have survived or not. He reminded me to make it clear that in 1969, people did die, notably at Lara, which is why that year's fires were named after this small town near Geelong. He is not sure how some of the fires that year started, but the one in which my uncle's house was lost was started by a nearby farmer harvesting on a total fire ban day. I get the impression that this was a known cause of fires, and the farmer was breaking the law by using his header on this day. He also says I am conflating two different stories with the 'koala incident'. The 'out the window treatment' occurred on an ordinary family outing when I was 2½, so he was not risking his life, but I was behaving appallingly! I have no memory of my own of this of course – my earliest memory being from about 6-12 months later, when I am handed up to ride in front of him on the chestnut mare Jenny. Dad reminded me that the koala's name was Dear Dear – curiously I could not remember what it was called, although I can remember the name of my sister's koala, even though her toy never achieved the same sort of status within the family. Dad says I was always doing perfectly horrid things to Dear Dear, like dunking it in the toilet. I'm glad that the story of him driving into the raging inferno for me is not true – it would have been a remarkably foolhardy thing to have done, no matter how big a tantrum I put on, and he does not have a reputation for foolhardiness. 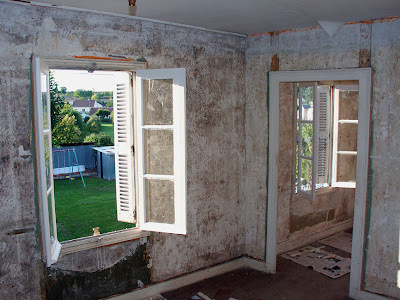 There are many British ex-pats living in France, and it is quite a common thing in the UK to hear that "the French don't like us" and that they "hate us buying all their old houses". This contrasts with our experience of being in France, and it is an especially sharp contrast with being in Preuilly sur Claise. Because we are English speakers we are always identified first as being English, and yet people have been almost 100% unfailingly polite (there is only one circumstance we can think of where we overheard a comment that was unflattering). It isn't that everybody is gushy-gushy welcoming to us, but they always take an interest in what we are doing. It is difficult for them especially if they have the misfortune to try speaking to me because my control of their language isn't spectacular, but even in that situation we just shrug to each other and agree to speak again later. When people find out we are Australians, however, they are really excited that we have chosen their country and their village to come and live in*. We are "the Australians" and are known as such - interestingly, because we have met another Australian who lives not 5km away, and yet no-one has mentioned him to us! We have met many of the members of the Town Council, and most of them have some sort of (usually quite tenuous) link to Australia; a neice in Melbourne, or a farmer who once sold some cattle to an Australian farm, but they always greet us if they see us on the street or in a shop or restaurant. This can make life a little frustrating for any guests we may have with us because progress can be rather slow, but it is nice to think that we are noticed. They all seem to know about this blog, even if they haven't actually read it. *This contrasts to the attitude in London. Whereas in London we get asked "why on earth would you want to come and live here?" In Preuilly it is almost "why wouldn't you want to come and live here?". 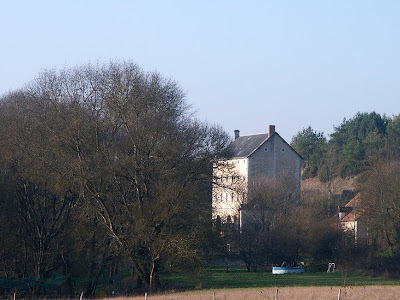 This tall building is on the Claise river between Preuilly and Chaumussay. We thought it was a mill, until we realised it is called la Forge ('forge' is the same in French as in English). We know absolutely nothing about its history, except that we have been told the names of some of the (former) owners. This is the same building, taken from the other side. 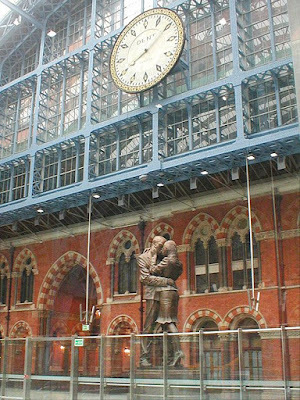 You can hardly recognise it as the same place. Update: We've had an email from someone who knows this building and the adjoining, older, farmyard complex. Apparently, although it is known as la Forge by everyone, and is marked on the map as such, successive owners have found no traces of a forge in any of the buildings. The tall building was actually a tannery! It dates from the late 19th century and the upper floor(s) were single very large open rooms used for drying sheep skins. The farm buildings include a couple of tiny cottages, a pigeonnier (dovecote), byres for animals and a large barn with a cave (wine cellar). We have written about Ste Maure de Touraine, our local goats cheese (chèvre) which is made on many farms in the area, but until recently we had not visited any of them. We corrected this oversight after we went to the truffle fair at Marigny-Marmande. 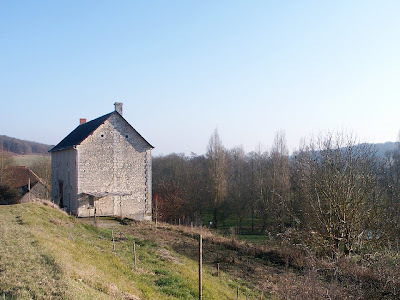 Just north of Ste Maure we saw a sign saying Chèvre Ste Maure de Touraine and pointing down a driveway. You see these signs all over the Touraine. We drove (rather tentatively) into the farmyard to be met by a pair of dogs, both of whom appeared to be excited to have met some new friends, and these were followed by a young man who opened up the shop for us. Next door to the shop is the "factory", observable through a large window. Through this window we could see one batch of cheese being made, and another maturing. For some reason it had never occurred to me that the cheese is formed "end on", as it were. The cheese is made from raw goat's milk heated to about 20°C (about 65°F) to which rennet is added. 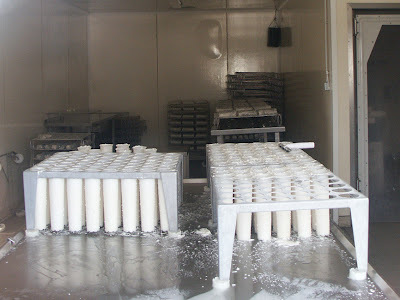 The milk thickens for a day and the curds are placed in truncated cone shaped moulds to be further drained and formed. Once set, the cheese is removed from its mould, sprinkled with charcoal and salt and allowed to mature for at least ten days. I am not sure when the straw down the middle is inserted, but I assume it is some time between the curds being put in the mold, and the set cheese being removed. 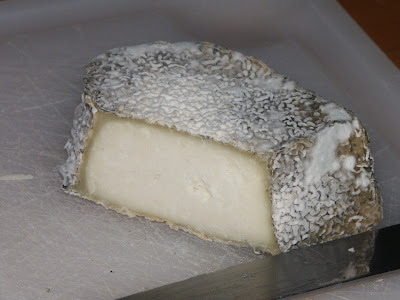 After ten days the exterior of the cheese is pale cream in colour with a soft delicate texture but no mould on the rind. At this stage it can be sold as "fraiche". Every day during the ageing process, the cheese is turned by hand, and a pale mould begins to grow. 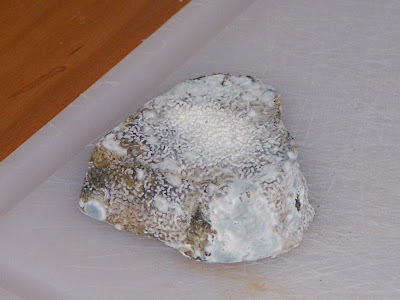 After three weeks the mould has darkened and the cheese has lost some of its weight and size, and after five weeks the mould becomes more pronounced but with a dry appearance and the interior has a firm texture. The finished cheese has a 45% milk fat content. When we buy our Ste Maure de Touraine from the market or our mini supermarket we are always asked if we want "plus fraiche ou plus sec?" i.e. do we want it less or more mature. We tend to go for the more mature version, but at Christmas we bought a "bûche frais", an un-matured variety. Although St Maure de Touraine is my favorite chèvre we didn't buy one here (we had an already started one at home) but we did buy a nicely matured "coeur sec" for 1.50Euro. For all its threatening demeanour, we were suprised by how mild this chèvre turned out to be - nowhere near the strongest we have had (for that, you need the little over matured "plugs" from the cheese molds we bought when Liselle was visiting). Although it looks a little pharmaceutical it still tastes like chevre, albeit a slightly sharp one. Now we have visited a cheesemaker and found it totally non-threatening, we will be visiting the ones nearer to home. There are at least two Ste Maure de Touraine makers within 5 km of Preuilly, and a number of non AOC cheese makers as well. Not far away is the co-operative dairy of Tournon St Martin where the AOC Pouligny St Pierre is made. We are also only 25km away from the co-operative at Verneuil. This is not a food post (you may be relieved to see) but a Simon Post. I have a three channel brain - that is, I can think, in depth, about three things at once. At the moment it is not enough for what I am trying to do; for that I would need a multichannel broadband brain with added brainy bits. I will start calling this the shower room - there is just no room for a bath in there. And, of course, there is another bathroom to do - an en-suite off the second bedroom. This one will have a bath (but no shower) a WC and a basin. 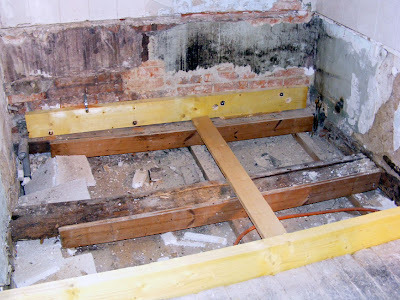 The reason for not having a shower is that it is in what used to be the "too small to use as a third bedroom" and has really nice chestnut wooden floors which we want to keep. This means trying to keep splashage down to a minimum - and trying to work out the best method of sealing the boards. At the moment I am leaning towards wax, because we don't want a plastic looking varnish on them. The second bathroom, from the second bedroom. Hopefully we can come to an arrangement for all this whereby we buy the fittings and do the water in bit, and the plumber does the drainage. Double hopefully we can arrange that this happens within the next 6 - 8 weeks. This means I have to do the carpenter thing soon. I have decided I want very few overhead lights. 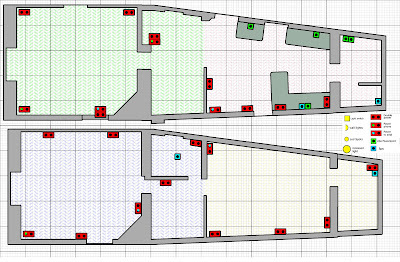 All the rooms will be lit by a number (probably 4 or 5) smallish low energy wall mounted up-lighters on two circuits, with additional standard lamps in the lounge. This is only the start - being France and not England, I have a choice of plugs and switches. I would really like the anodised aluminium ones, but can we afford them and should we have a different, co-ordinated colour in each room?? Then there is the Kitchen. Don't get me started on kitchens. So many choices, every single one of them wrong. And the first person to mention secondry glazing for traditional French windows will be sent to the naughty step for the next billion years. In Aug-Sep 2008 my wife and I spent 4 weeks travelling in Scotland and France. I have been a coeliac for 8 years and this was our first overseas trip where we did our own shopping and cooking. In France our 2½ weeks was spread between 4 areas – a few days with family in a country village in the Loire Valley, a few days at a B&B (called chambres d’hôte) near Bordeaux in the south west, a week in the Dordogne in a gîte (= fully furnished place where you self-cater) and a few days in a hotel in Paris. At most of these places we self-catered. Even the B&B ended up with a kitchenette, so we did our own thing. We visited many good-sized supermarkets, none of which had any gluten free specialities except rice cakes, which was very disappointing after our success in Scotland. Near the end of our trip we visited a huge supermarket called Auchan that had a delicious range of gluten free biscuits, but no pasta, bread etc. Luckily I had some left-overs from Scotland because I was getting tired of rice cakes and jam for breakfast and rice cakes and tomato and cheese for lunch. Since the supermarkets were so poor my sister-in-law suggested we try a health food shop to look for gluten free specialties. We were half way through our journey before we found one of these and they had all sorts of goodies – pasta, breakfast cereal, bread etc. I am sure they are more common than our experience – but it was the only one we noticed although we didn’t spend our holiday looking in town after town hoping to find a “Bio Co-op”. Obviously the catering at home or picnic lunches were no problem other than shopping for specific gluten free specialities. 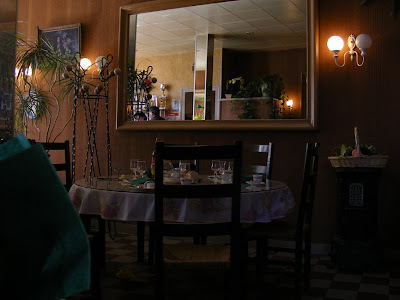 One night we ate at the local hotel in my sister-in-law’s village, Preuilly-sur-Claise. The owner spoke good English and following an explanation of my requirements we had a wonderful 3 course meal with GF choices and it was great value too (about 25 euros each, including drinks). We also had a couple of lunches in cafés. My sister-in-law speaks [a bit of] French and explained what I could and couldn’t have. One of them was a very nice 3 course meal and was only 13 euros. I got a bit worried when my plate was whisked away soon after starting to eat because the kitchen realised it had done something wrong – a new plate (looking just the same mind you) was delivered soon after with a stream of apologies. These experiences are both good and bad. On the one hand it spoils your afternoon while you wonder if they got it right – but they did, I didn’t get sick. And on the other hand, you feel confident that they are paying attention to your request, albeit slowly, and will own up to a mistake. 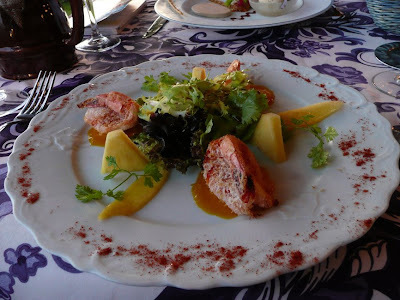 This experience was not unique to France – they were able to whisk away my plate in Scotland too and replace it with something similar. We feel that we got on quite well despite our meagre language skills – nearly everyone spoke some English and was very accommodating once they realised we were trying. With my sister-in-law’s help, we made up a simpler version of the gluten free card which was successful – only twice did the kitchen find it all too scary and I ended up with an extremely bland meal. We were advised, and we noticed it for ourselves as well, that a café will do almost the same menu for lunch at about half the price of what they charge for dinner. All the café lunches we had were really good. So if you can get yourself organised to sit down for that long at lunchtime, then this is the best value eating you can get. The eating highlight of our trip was in the Arcachon area, which is famous for oysters, seafood and coastal tourism. We decided to try the local fare and so with guide book in hand we started deciphering the menus in the windows of some neighbouring seafood restaurants. On our second pass, a local lady could tell we were unsure of some of the dishes and she offered to help us read the menu and point out what they were made of and whether we might like them. Feeling quite reassured we headed inside. Our waitress had some English and once she understood what I needed to have, she couldn’t do enough to help us – back and forth to the kitchen offering up all sorts of options and alternate (GF) sauces. It was like pre-coeliac days where you could have one of so many things, the food was fantastic and you were confident the kitchen would get it right. The third part of the trip was inland of Bordeaux to an area called the Dordogne. There is amazing history and scenery here with castles built by Richard the Lion Heart, the prehistoric Lascaux cave paintings, towns built on or within cliffs, magnificent gardens, numerous outdoor activities (we can recommend drifting/canoeing down the river) and the home of foie gras – so a foodie's heaven. 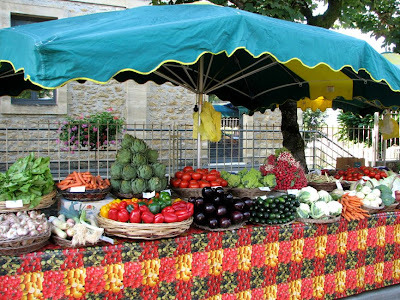 We went to our first large markets at Saint-Cyprien to stock up again. This was a lot of fun – we picked up all sorts of olives, salamis (GF) [in French, saucisson], fruit, veg, cheeses, wine, etc. We took this home to the gîte and ate very well for many days. 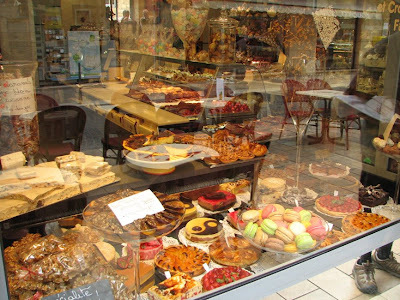 The daily trip to the boulangerie (bread shop with lots of pâtisseries) was torture. My wife needed a chocolat éclair or a tarte tatin, or … most days and all I could do was drool. Every shop had meringues though, and it is amazing that they can vary in flavour so much. Be careful though, you have to check each time because occasionally they said they were made with flour. In one stunning shop I asked about something I suspected might be OK. Try as we might the shop assistant couldn’t understand what we were getting at and soon disappeared out the back. When she returned she brought the chef with her whose English was perfect and he pointed out a few different things I could have. Too hard to choose, so I had the lot! 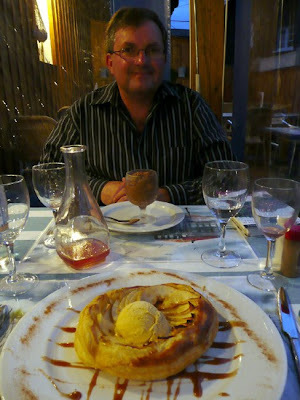 Paris was the least interesting foodwise as we were totally reliant on eating out. The hotel breakfasts were no good for me and perhaps because we didn’t choose places that were expensive enough the attempt we had at an evening meal was so dull we didn’t try again, being content with a nice lunch from small cafés in side streets. 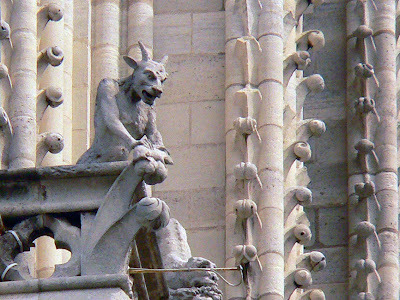 I certainly won’t be shy about visiting France again and really enjoyed the culture, history and people. And while I have mentioned some of the negative side of eating, it was still only minor and you can usually get quite good food. Quick note from Simon. Citroën are relaunching a DS for the 21st century today. If this needs explaining: shame on you, but look here.